‘Pessimism around poor agricultural performance coupled with optimism about its potential and its necessity as an engine of growth and development combine to inform many of the most popular agriculture centred policy recommendations for Africa’ (Oya, 2010:85). Indeed as Oya notes, literature on determinants of agricultural policy in Africa often gravitate towards two polarizing views. On the one hand, scholars like Bates and De Walle argue that agricultural policy in Africa is determined by neo-patrimonial interests. Neopatrimonialism can be defined as a hybrid regime consisting of a state like apparatus (the “neo”); and a patrimonial spoils network in which centralized elites mobilize political support by using their public position to distribute rent-seeking opportunities (Bratton & van de Walle 1994). On the other hand, scholars like Diao, DeGrassi and Oya argue that ‘intended’ and ‘unintended’ outcomes from political and socio-economic processes have shaped agricultural policy over time. As they assert, factors such as colonial history, ideology, commodity bias, urban bias, poor data and structural adjustment policies which reflect varying interests in society are in fact the determinants of agricultural policy. In drawing insights from both arguments yet negating some elements in the former, this essay argues that multiple competing interests from local and international actors shape agricultural policy in Africa. Further, it illustrates through case studies on Senegal’s Agro Pastoral and Forestation Orientation Act and Kenya’s Strategy for Revitalizing Agriculture policy, the importance of taking into consideration economic and political exigencies when analyzing determinants of the same. 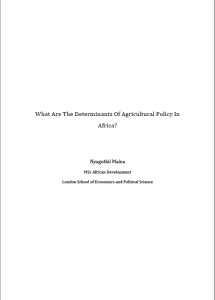 This essay is structured into three parts: the first part highlights and analyzes the various arguments made on determinants of agricultural policy in four time periods in Africa: the colonial and post-colonial state era in the 1950s and 1960-70s, the structural adjustment period in the 1980s and contemporary period. In doing so it draws attention to the heterogeneity of initial conditions and highlights various factors in the past that continue to shape agricultural policy in the present. Indeed agricultural policy isn’t entirely path dependent and as this essay shows, factors such as local agency through farmer associations and civil society inform it as well. The second part highlights the determinants of contemporary agricultural policy by analyzing Senegal’s Agro Pastoral and Forestation Orientation Act and Kenya’s Strategy for Revitalizing Agriculture policy, while the final section concludes with observations based on the foregoing.